The mission of the residency is to prepare optometrists to provide full-scope primary pediatric, vision therapy, and vision rehabilitation optometric care by providing post-graduate clinical experience beyond that provided in the Doctor of Optometry program, in a setting that promotes excellence in patient care, education and research. Objective: The resident will develop a high degree of efficiency in the provision of primary eye and vision care services, particularly focused on pediatrics, strabismus and amblyopia, vision related learning problems, vision therapy and vision rehabilitation. 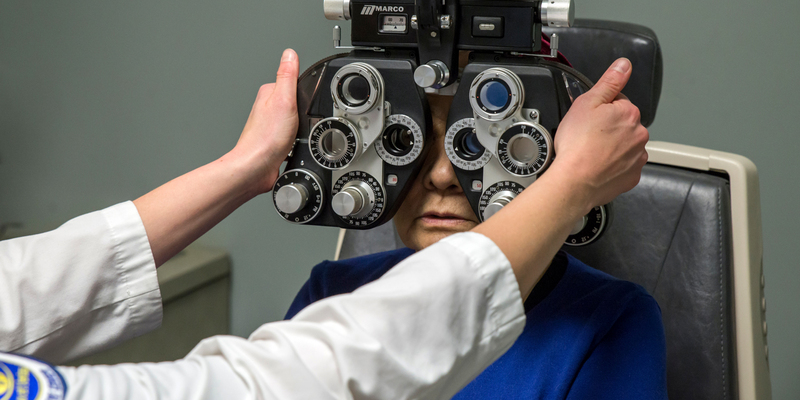 Outcome: The resident will provide primary eye and vision care services involving a minimum of 1000 patient encounters via comprehensive exams, functional exams and vision therapy. A minimum of 200 encounters will be pediatric patients and 150 encounters will be traumatic and acquired brain injury. Goal 2: Develop the resident’s expertise in vision re/habilitation therapy to a wide variety of patients. Objective 1: The resident will determine vision therapy procedures and apply them appropriately as indicated for each patient. Outcome: The resident will consistently select and successfully perform proper vision therapy procedures at the appropriate level of complexity for the patient. Measure: The resident will be evaluated quarterly by the supervisor to determine if the appropriate vision therapy procedures are being applied at the appropriate level. The resident will perform vision therapy on a minimum of 700 patient encounters, with a minimum of: 200 vision related learning problems, 200 accommodative, binocular, and oculomotor dysfunctions, 100 with strabismus or amblyopia, and 100 autism spectrum, ADHD, and acquired brain injury. Goal 3: Strengthen the resident’s expertise in the diagnosis and management of refractive, physiological and pathological conditions of the eye, the adnexa, visual pathways and the central nervous system. Outcome:The resident will consistently select and successfully perform the proper diagnostic procedures as indicated for each patient. Measure:The resident will be evaluated quarterly by the supervisor to determine if the appropriate level of technical and cognitive ability is being exhibited. The resident will chose the appropriate electro-diagnostic tests for the patient which may include but not limited to: visual evoked potential, electro-nystagmography, visagraph, vestibular auto-rotation test, and Impact testing. Objective 2:The resident will determine the correct diagnoses for each patient. Outcome:The resident will consistently select the correct diagnosis for each patient with increasing independence as the residency program progresses. Measure:The resident will be evaluated quarterly by the supervisor to assess the appropriateness of the resident’s diagnostic ability. Objective 3:The resident will determine the best management based on the diagnoses. Outcome:The resident will consistently devise an appropriate management plan for each patient in order to best address the patient’s needs. This will include use of therapeutic lenses and vision re/habilitation therapies. Measure:The resident will be evaluated quarterly by the supervisor to assess the resident’s management skills. Goal 4: Expand the resident’s knowledge of specialized diagnostic instrumentation. Objective 1: The resident will develop expertise in interpreting ophthalmic visual fields and/or campimetry particularly as related to neurological disease and traumatic brain injury. Outcome: The resident will perform and interpret the results of ophthalmic fields on at least 12 patients who have neurological disease or acquired brain injury. Objective 2: The resident will develop expertise in the utilization of advanced ophthalmic diagnostic instrumentation to rule out ocular, systemic and neurological disease, and to demonstrate the functional nature of amblyopia. Outcome: The resident will perform and/or interpret tests with advanced ophthalmic and vestibular diagnostic instruments (e.g., Platform Posturography, Oto-acoustic emissions, ENG, VAT, Visagraph, VEP) on at least 50 patients. Goal 5: Develop the resident’s skills in presenting topics to fellow professionals. Objective: The resident will acquire and practice skills needed to effectively present information to other professionals in group settings. Outcome: The resident will present lectures during meetings of the clinic or other health care providers at least once per quarter. The resident will, when possible, also present posters or lectures in other settings such as the College of Optometrists in Vision Development, the American Academy of Optometry, NORA, SECO, AOA or other such meetings. Measure: The resident will report monthly on these types of activities using the activity log. Goal 6: Instill in the resident an appreciation of the importance of scholarly activity. Objective: Educate the resident in the preparation of a professional manuscript. Outcome: The resident will prepare at least one publication-quality manuscript on an approved topic. Measure: The resident will complete the manuscript by the designated completion date. The paper may be submitted for publication. Objective: The resident will develop a high degree of efficiency in the provision of primary eye and vision care services, particularly in the area of pediatrics, strabismus and amblyopia, vision related learning problems, vision therapy and vision rehabilitation . Learning Activity: The resident will provide primary eye and vision care services involving a minimum of 1000 patient encounters, 35% of which will include obtaining a case history, performing a full functional/behavioral evaluation in addition to the routine optometric examination. These encounters will include but not be limited to: strabismus, amblyopia, binocular dysfunctions, accommodative dysfunctions, ADD/ADHD, autism spectrum and acquired brain injury. Objective: The resident will develop a high degree of efficiency and skill in providing vision re/habilitation therapy services to a wide variety of patients. Learning activity: The resident will perform vision therapy on a minimum of 700 patient encounters. Outcome: The resident will become proficient in providing vision re/habilitation therapy services to a wide variety of patients in a private practice setting. Objective: The resident’s expertise in the diagnosis and management of refractive, physiologic and pathologic conditions of the eye, the adnexa, visual pathways and central nervous system will be enhanced. Learning Activity: The resident will provide services to a significant number of patients with refractive, physiologic and pathologic conditions of the eye and vision, particularly in areas of a functional/behavioral evaluation in addition to the routine optometric examination. The resident will formulate a diagnosis based on the results of the procedures performed. These encounters will include but not be limited to: strabismus, amblyopia, binocular dysfunctions, accommodative dysfunctions, oculomotor dysfunctions, visual-auditory integration dysfunctions, visual motor dysfunctions, visual perceptual dysfunctions, visual information processing problems, ADD/ADHD, autism spectrum, acquired brain injury from stroke, trauma, or neurological disease. Objective: The resident will utilize a wide variety of diagnostic procedures and instrumentation while caring for patients. Learning Activity: The resident will perform and/or interpret ophthalmic diagnostic tests that can include electro diagnostics, ophthalmic photography, indirect ophthalmoscopy and relevant laboratory and radiological procedures. In addition, the resident will perform and/or interpret visual-vestibular testing (OAE, ENG, platform posturography and VAT). Outcome: The resident will develop advanced knowledge of specialized diagnostic procedures and instrumentation. Objective: The resident will develop and present original presentations to other health care professionals. Learning Activity: The resident will present at least one lecture per quarter to the clinic or another staff/group and when possible will present posters or lectures in other settings such as the College of Optometrists in Vision Development, the American Academy of Optometry, SECO, NORA, AOA and other such meetings. Objective: The resident will engage in scholarly activity. Outcome: The resident will develop an appreciation for scholarly activity and its importance to the profession. The paper will be submitted to a peer reviewed journal. The residency program is 54 weeks in length. It will run July 1 – July 15 of the following year. The resident is eligible for thirteen days annual, sick, or personal leave. The resident is also eligible for 5 educational leave days to attend approved professional meetings. Annual and educational leave is granted with prior approval of the Supervisor in conjunction with the SCO Director of Residency Programs. A. The resident is defined as an employee of Neuro-Vision Associates of North Texas and the residency stipend is paid by Neuro-Vision Associates of North Texas. No tuition or fees are applicable. B. The resident should apply for optometric license in Texas prior to the beginning of the residency. C. Professional liability protection for residents for professional activity performed at Neuro-Vision Associates of North Texas. and Neuro-Developmental Sensory Enhancement Center is provided by Neuro-Vision Associates of North Texas. E. Resident privileges will be determined by Neuro-Vision Associates of North Texas. A. The resident is required to deliver clinical services at a level that is satisfactory to the Residency Supervisor, Director of Residency Programs, and the SCO and Neuro-Vision Associates of North Texas. Normal clinic hours are M-Thurs 8:30-6:30, Fri: 8:30-5, and Saturday: 8:30-2. The resident is expected to be present in the clinic during all scheduled working hours, except when attending or delivering lectures or doing research. The resident will be given one day off during the week for research and professional development. The resident will occasionally be required to be on call. E. The resident is expected to perform in a professional manner in the delivery of patient care services and to observe those proprieties of conduct and courtesies that are consistent with the rules and regulations governingNeuro-Vision Associates of North Texas and Southern College of Optometry Residency Programs. H. Any resident accepted for training can be dismissed, without receiving a certificate of completion, for infractions of the rules and regulations of Neuro-Vision Associates of North Texas or those set forth by Southern College of Optometry, or for any action which jeopardizes the safety of patients, personnel, or physical facilities. A residency stipend will be provided for the year of training paid by the clinic. The stipend is $37,385. Compensation is not contingent upon productivity of the resident. Additional benefits such as FICA and professional liability insurance are also funded by the clinic. The resident will have the opportunity to purchase health insurance through Neuro-Vision Associates of North Texas. The residency program at Neuro-Vision Associates of North Texas is fully accredited by the ACOE, 243 N. Lindbergh Blvd., St. Louis, MO 63141, 314-991-4100.